The rain we received this past weekend was awesome! I was so excited to go to my rain gauge and find something in it besides dust! Truly Friday night and Saturday were a blessing and now they are saying that we could have a shower possibly even as you read this. But this past week was also one that I was so ready to get past. Let me explain. The Sunday before last I was having trouble with my voice. My Deacons prayed that I would be able to preach and I did in both morning and evening services. But it changed on Monday. I struggled on Monday. My voice was raspy and it was very uncomfortable. Monday evening I went to prayer time but quietly prayed and then I whispered through Deacon’s meeting. On Tuesday, my voice was pretty much gone. I went to the doctor and got a couple of shots. Yet the struggle continued. At times I think Vicki kind of liked it. She would ask me a question then say - “Oh, I forgot, you can’t talk.” Then she would just grin! I was really feeling the love! Others were picking on me as well. Bro. Eugene sent a text to me to see how I was doing. I texted back and told him that I just wanted my voice back. He replied, “Don’t hurry, and let everyone enjoy the silence!” Can you feel the compassion? It seems that for the preacher to be without a voice at times makes some folks pretty excited. The remainder of the week I was careful to talk quietly, if I talked at all. I went to Harper’s 6 year old birthday party on Saturday afternoon and just sat back and watched. When I got up on Sunday morning, I took care of my voice so I didn’t strain it. I just wanted to be able to preach. So I kept pretty quiet through Sunday School and didn’t sing during the song service. Then I got up to preach and was able to get through the entire message. As I thought about the silence that I had to endure (and everyone else got to enjoy), it made me stop and think just a bit. I know that Bro. Eugene would continue to tell me ‘just let everyone enjoy the silence.’ But God didn’t call me to be quiet but to speak the Truth whenever I had the opportunity. In the midst of the struggle I was in, God was right there. He promised that He would ‘never leave us nor forsake us.’ (Heb. 13:5). God has called me to proclaim Him to the world that I encounter daily. When I can’t do that the struggle rises up in me. Then I went back to Psalm 46. I read the whole Psalm, but getting to v.10 really spoke to me. It says, “Cease striving (be still) and know that I am God; I will be exalted among the nations, I will be exalted in the earth.” God would not be forgotten just because I couldn’t talk. If you know me, you know that being still is ordinarily not the way I am. But this past week, God didn’t give me much of a choice. My voice was gone and the only thing anyone could hear from me was a cough. 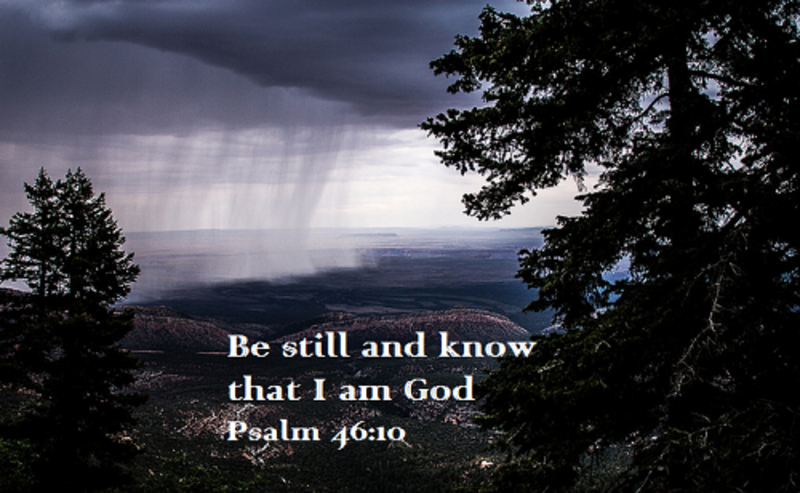 So it became a time for me to ‘be still’ and consider what God was doing in my life. My voice left, the rain came and God was exalted. It was truly an awesome week as the quietness gave way to His glory. Truly -- JESUS, JESUS, JESUS, there IS something about that name! !